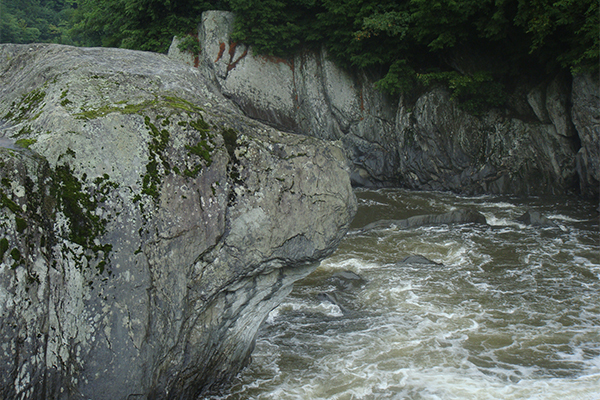 Just below the waterfall, a massive profile of a canine quickly indicates the origin of this waterfalls' name. A topic of controversy is what breed of dog; perhaps a Saint Bernard? This waterfall is actually known as Upper Dog's Head Falls to some. 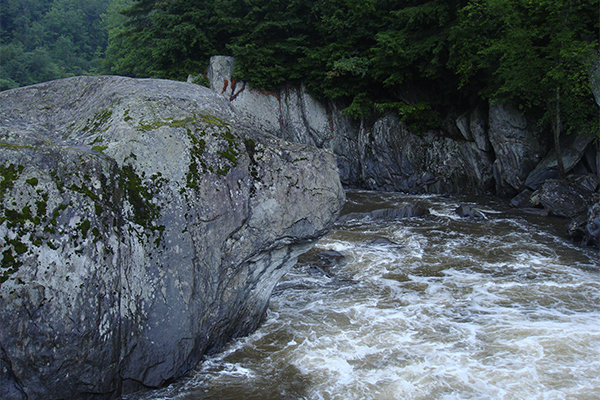 Directly upstream of the dog's head profile is 6 feet of incredibly powerful cascades. The color of the water has a yellowish tint and very strong currents current the entire river, eliminating all desires to swim in the deep pools below. 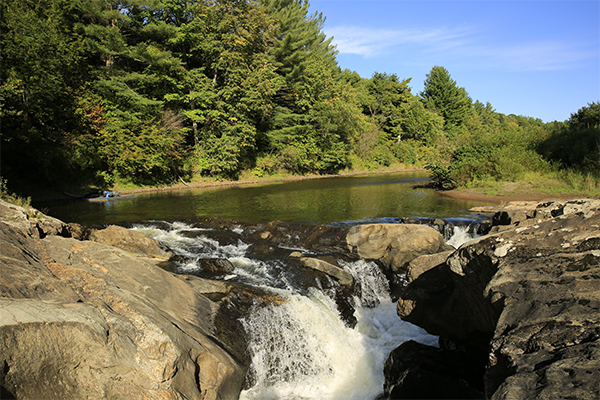 Lower Dog's Head Falls, sometimes called Sloping Falls, consist of two sections of 5-foot cascades and rapids, and are found downstream near a lumber mill. 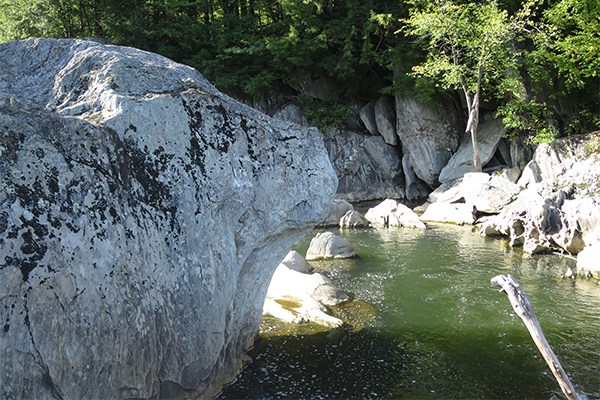 It is said that during low-water conditions, the entire volume of the Lamoille River travels hidden underneath a wide natural bridge that spans the entire river. 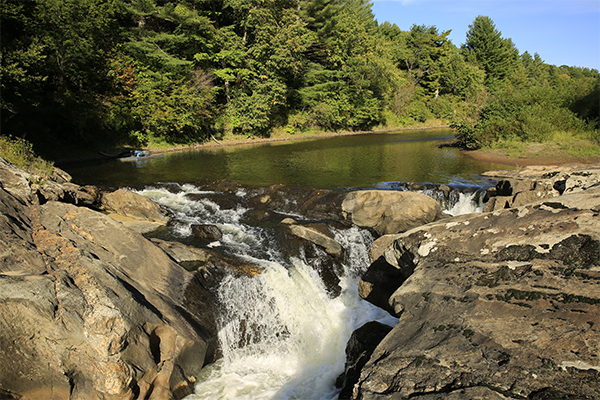 Dog's Head Falls can also be visited as part of a biking trip along the Lamoille Valley Rail Trail, which is one of the premier rail trails in Vermont. An obvious path begins at the pull-off described in the directions below. From the pull-off, walk through a small field and then bear left into a short stretch of wooded area. 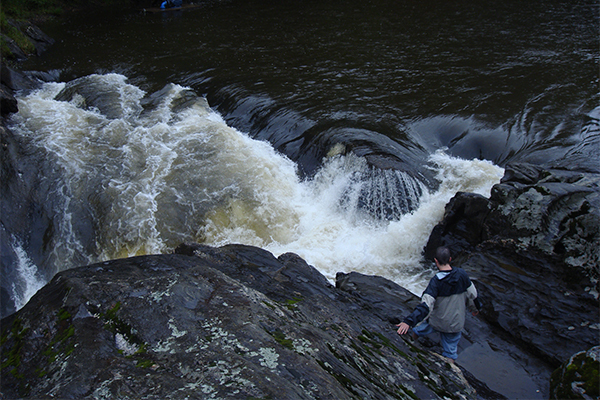 The falls and the backside of the dog's head profile will be just ahead, accessed by a relatively easy hike across some rocky ledge. Take caution if the ledges are wet as they can be very slippery. From the junction of VT 15 and VT 108 in Jeffersonville, take VT 15 east. Continue traveling on VT 15 east for 0.7 mile past the “Welcome to Johnson” sign. Please note that this is not actually the town’s official border. Take a right onto Railroad St just before reaching the center of Johnson and follow it for 0.3 mile. Take a left onto River Rd East immediately after going through an old iron bridge. 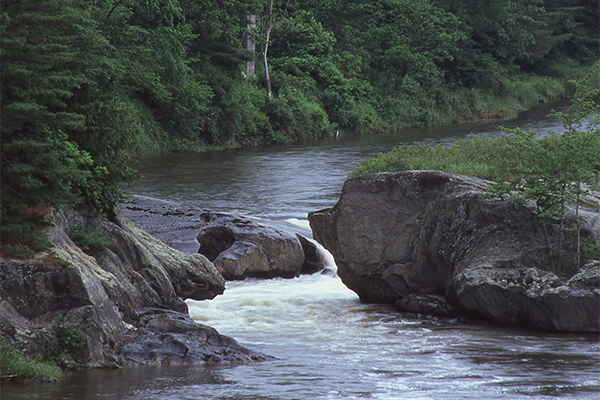 Follow River Rd East for 0.8 mile to a small pull-off on the left side of the road. To get to Jeffersonville, take VT 15 east from Burlington or VT 108 north from Stowe.